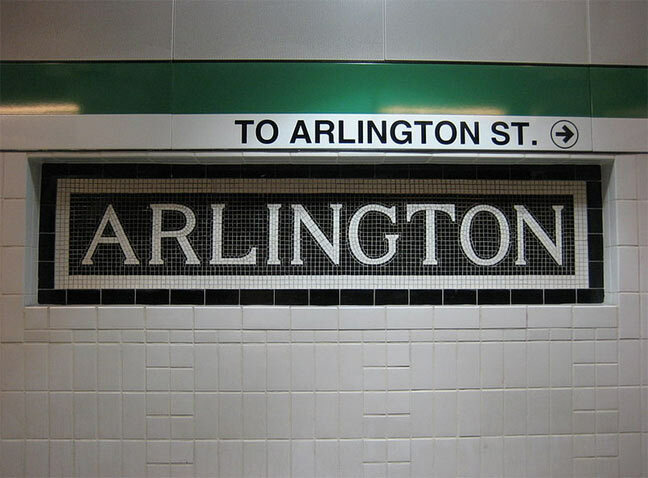 When Boston’s MBTA Green Line Arlington station in Back Bay was under renovation in 2006, one of its original mosaic signs was discovered. The sign was incorporated into the redesign, which largely kept the standard MBTA Helvetica signage with color bands. I seem to use the Green Line more than any other lines in Beantown, which I haven’t visited since 2006. I was thinking, at first, when I saw this that there is an Arlington Station in Boston which looks JUST LIKE the one you are posting about in NY. Lo and behold, you ARE talking about Boston! I passed Arlington Street station every day on my way to school in Brighton, MA. Since we went to an all girls school, the trolley was where we met boys (Boston Latin, Boston English, Neuman Prep, Boston College High…all of them boys schools!). I remember those mosaics! AAHH!!! The memories!!! Thanks for taking me back…. You’ll have to come back and ride the Green Line again. Some of the older stations and tunnels are a bit scary. I use the Orange Line which is OK. They did the same for South Station when it was being renovated and discovered the old mosaic tiles reading “South Station Under”. Many of the older station have these but station names were changed over the years so some of them would be confusing to riders (the Blue Line at Government Center has visible tiles at the end of the platform that read “Scollay Sq”). The “under” denoted a connecting station a level above, and only three stations had the name: Scollay Square(Blue Line under, Green Line upper), Park Street(Red Line under, Green Line upper), and formerly South Station(Red Line under, Atlantic Ave. El upper). Arlington has always been just Arlington. It never had a second level, the closest thing to an “upper” was the street cars that used to serve before the Huntington Ave. spur was built in 1941. It was, indeed, wonderful to see this mosaic uncovered and then preserved. My vote, though, goes to the SCOLLAY UNDER mosaic sign on the Blue Line (lower level) at Government Center, restored the last time Government Center got some attention. We are coming up on a two-year shutdown of Government Center for a major renovation. I hope SCOLLAY UNDER survives this time around, too. In regard to why the old signage may have been retained in the new design of the station, it is possible that, because the lettering is white-upon-black, and is therefore ADA-compliant as it relates to visually-impaired people, a “null-hypothesis” analysis may have been employed– i.e., “We don’t have to do anything or spend any money for this, so lest we be thought of as wasteful, let’s just go with what we’ve got.” After such extravagant spending as occurred on the Big Dig project, well in excess of what it would have cost had corruption not crept in, such thinking would have been applauded in Boston. Preservation of old T history is all well and fine, but Boston’s Puritan-heritage ethos of “Use up, wear out, make do, or do without” cannot be disregarded, either. It’s purely artistic reasons for retaining the signs, nothing more. That and they are easily maintained and very hard to deface unlike the metalic and enamel signs. Knowing how bureaucracies work, I’m sure someone somewhere along the line came up with some explanation somewhat like mine for justifying doing nothing, had the point ever been raised. Trust me, when you’re dealing with a situation and people can make a virtue of inaction, while getting paid for it, they’ll do it every time. That’s where I was coming from on that. That kinda looks like a BMT tablet. Scollay Sq. That must be the station where “Charlie’s wife hands him a sandwich every day quarter past two, as the train comes rumbling through”. Charlie fate is still unlearned. I think. it’s a beauty. just like the IRT & BMT stations. Though I’m a New Yorker, I lived in Boston for 20 years and used this station quite a lot. Had an apartment on Haviland Street right around the corner (when I was at Berklee for a couple of years), and then used the Green Line for the many years that I lived out in Brighton. The Auditorium station on the Green Line was originally called “Massachusetts” for the Masschusetts Avenue, or “Mass Ave” to the locals, the main east-west street that crossed above it. When the station was re-hab’d during the mid 60s along with the rest of the Green Line, the same style tablets that said “Massachusetts” were painted over. However for some period of time, at leaset one or two original station name mosaic tablets were uncovered along each of the track walls (eastbound and westbound sides), and were visible. The color scheme was dark brown tiles with white lettering. There was also eons back, an intermodal transfer point between a small trolley terminal behind the building with the this station underneath, just up from the corner of Newberry Street & Mass Ave. There were stairs from this off-street area down to the station however everything had been sealed and walled up years before. However, at one time some kind of rehab work was being done, and just in front of the token booth beyond the turnstiles, one morning, I saw passageways that had been opened (wow!) so I walked around them and explored. There were at least two of them, slightly inclined and very narrow, going north maybe 40-50 feet or so, to the point where they met the stairs from the off-street trolley terminus. There may have been a joining cross passageway between the two – I don’t remember. There were also alcoves that led to doors to long sealed public restrooms for men and women….. lots of urban transit archeology behind those walls. There were also wide staircases that went directly down from this sealed up intermodal transfer area to each of the subway platforms for today’s green line. I don’t remember seeing them from the sealed in area beyond the turnstyles but maybe I did – I don’t remember. This was in the early mid 70s. 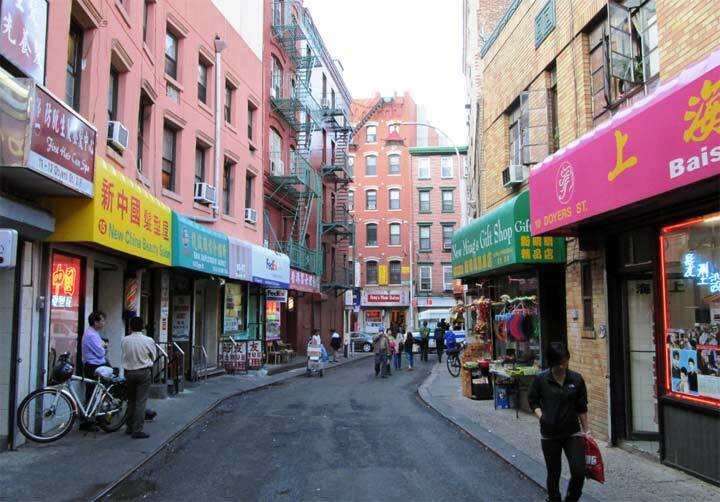 I do remember that during this project, the stairway for the park st. bound side, was opened – false wall was knocked down maybe? and replaced by a floor to ceiling wooden false wall. When I acquired a number of early 20th century Boston Transit commission reports – there were plans for this area, in the volume that discussed extending the Green line beyond Arlington Street. In the station after you paid your fare, there were stairs on either side for the in or outbound platform.